We all have our favorite muscle building training program. Or perhaps it’s our go-to supplement stack for assisting with our bulking phase. But what about our diet and the food we eat to grow? Simply consuming calories to excess should lead to growth (albeit muscle and fat), however it may not be the optimal way to add lean muscle mass. Also, if you want FREE access to my 'Eating For Muscle Gain' guide be sure to download it HERE. Training Stress – Resistance training stresses the muscle, joint and nervous system, sending signals for the body to adapt. Adequate Recovery – The body needs to heal and recover from the stresses of training. Without adequate recovery we cannot adapt and grow. Supportive Diet – Perhaps the most important of the 3 components in regards to muscle growth. Natural 1950’s bodybuilder Vince ‘Iron Guru’ Gironda often stated that muscle growth is 90% nutrition. Gironda, a master of muscle mass and aesthetics, trained in an era before steroids were available. His tremendous physique was a product of nutrient dense food that optimises our anabolic hormones: testosterone and growth hormone. 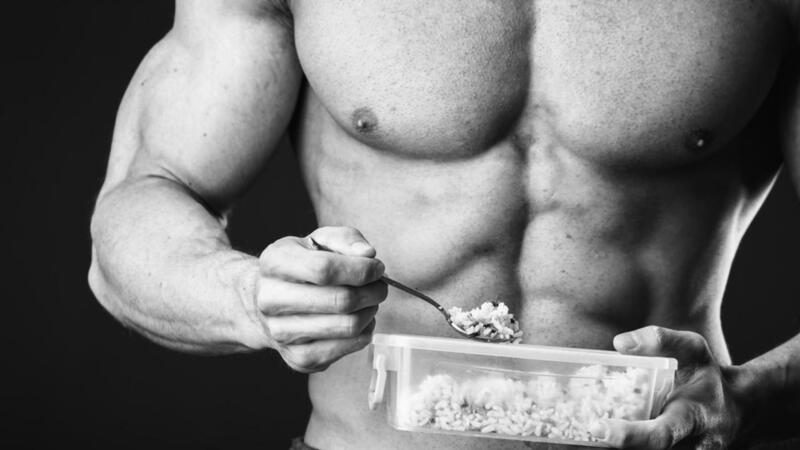 So what are the top 5 foods to naturally increase our anabolic hormones, while providing the nutrients to support muscle growth and energy for training? Let’s take a look. 3. 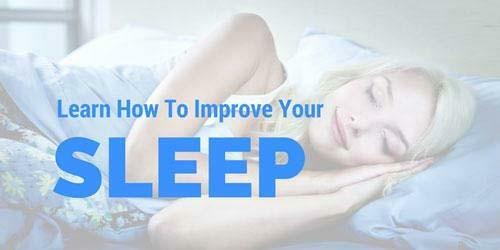 Increasing growth hormone secretion at night (3). Growth hormone is the bodies most potent muscle builder. Full fat milk is packed with muscle building saturated fat. The protein found in milk is one of the highest quality sources of protein in our diet (4), this meaning the human body does a great job of digesting and absorbing the nutrients found in milk (assuming you can tolerate dairy of course). There’s a reason why baby mammals drink milk for growth! 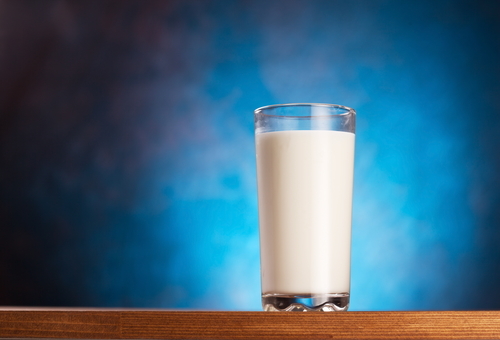 Milk has been used by bodybuilders and strength athletes for years. George Hackenschmidt ‘The Russian Lion’ drank 5L of milk a day. Frank Zane regularly consumed raw milk and cream in his diet. These muscle bound monsters weren’t drinking skim milk! Fat was a huge part of their diets. Frank Zane, Vince Gironda and even Arnold Schwarzenegger all consumed plenty of saturated fats from dairy, meat and eggs. The best type of milk for muscle growth is full fat unhomogenized (cream on top) & unpasterisued (raw) milk from grass-fed organic cows. It is loaded with beneficial protein and fat; plus the beneficial fat globules have not being destroyed by a homogenization process. If you are one of the unlucky ones who cannot handle lactose, you can still reap a lot of the benefits of milk by consuming butter and cream. Egg yolks provide nutrients and energy to grow a baby chicken. Any food that performs such feats deserves a spot on a ‘five foods you need to eat to grow’ list. As with milk, many of the world’s top bodybuilders swear by eggs and in particular egg yolks. Vince Gironda advocated eating 36 eggs a day! Casey Viator (who became Mr. America as a teenager) ate 2-dozen eggs every day. And we’ve all seen Rocky Balboa down raw egg in his quest for glory! So what’s so special about eggs yolks when it comes to muscle mass? Nutrient density, fat content and absorption. Eggs are packed full of nutrients including vitamin K, zinc, selenium and B vitamins. For example, egg yolks contain the B vitamin choline. Choline helps the body utilize higher fat diet intakes, great for those upping their food and fat intake during a bulk. Egg yolks are full of cholesterol. If you’re worried about eggs and high cholesterol, please don’t be. Studies have shown that eggs do not raise LDL particles (the bad cholesterol) (5). For more on this topic be sure to read my article - 9 Reasons Why Your Doctor Is Wrong About Fat. No more egg white omelets if you’re looking to maximize your gains! Finally, like milk products, eggs have a high protein quality score making them not only nutritious but easily absorbed by the body. Looking for more diet & supplement tips to help you pack on muscle mass? Be sure to download my FREE 'Eating For Muscle Gain' guide by clicking HERE. Yes you read that right – liver is the 3rd food that you need to eat to grow. Liver is often regarded as natures multivitamin. 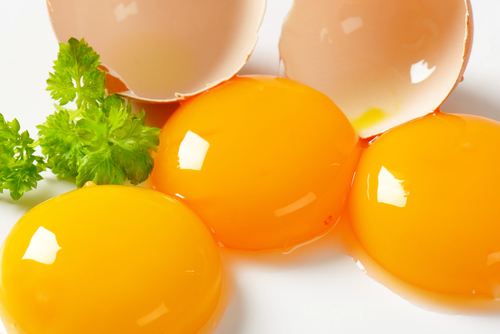 The vitamin packed egg yolks pale in comparison to the nutrients found in liver. How nutrient dense are we talking? One study found that organ meats such as liver had 18x the nutrient load of grains and 11x of vegetables– unfortunately this study didn’t factor in bio-absorption properties, as this would have pushed this ratio even higher. Although this is all beneficial to our health, the real reason why liver is in this list is because of one particular vitamin – vitamin A. Not only this but the vitamin A found in liver decreases estrogen production in men. While diets high in protein actually deplete our bodies vitamin A reserves. 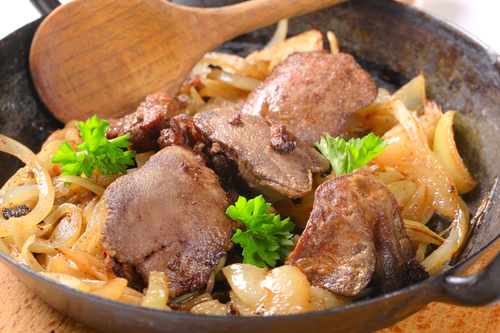 So if you’re not willing to cut back on your protein intake add some liver to your diet. Sweet potatoes are the best source of carbs for refueling and assisting with muscle growth. 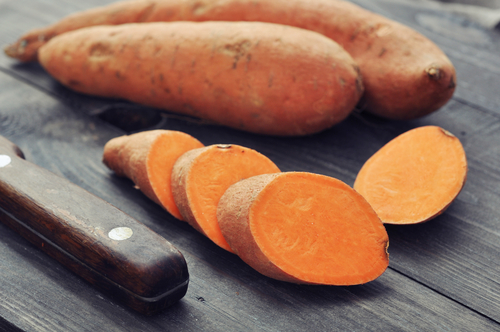 Rice and glucose powders can be useful, but nothing compares to the power of the sweet potato. Not only are sweet potatoes packed full of nutrients such as vitamin A, vitamin C, copper and B vitamins, sweet potatoes are rich in potassium. Many people have a poor potassium: sodium ratio. This is a result of eating too many processed and refined foods. Increasing potassium can therefore lower cardiovascular disease risk and help with bone density and blood pressure. More importantly potassium protects lean muscle mass. When potassium levels are low, the body breaks down muscle tissue to release potassium. In order to grow and increase muscle mass we must supply the body with adequate potassium. Sweet potato is a tasty way to achieve this. Sweet potato also provides the body with quality carbohydrates. Grueling training sessions burn through liver and muscle glycogen stores. Strength gains, growth and fuel for higher volume hypertrophy training can all be assisted by eating extra carbohydrates. Oysters are rich in nutrients and minerals and are one of the best sources of omega 3 fats in our diets. These fats are anti-inflammatory, helping us to recover from our intense training. Oysters are high in the essential yet hard to come by DHA omega 3 fat. DHA is critical for human health and a lot of us simply don’t eat enough of it. Zinc is one of the best micronutrients to increase your testosterone levels. Zinc slows the conversion of testosterone into estrogen while also assisting in testosterone production. 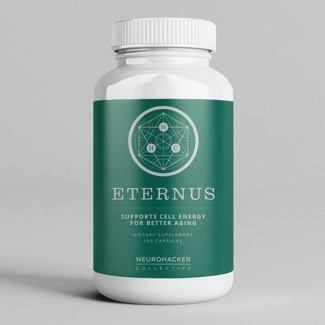 Studies have shown supplementing with zinc increases testosterone levels while restricting zinc intake drastically lowers testosterone levels (7, 8). 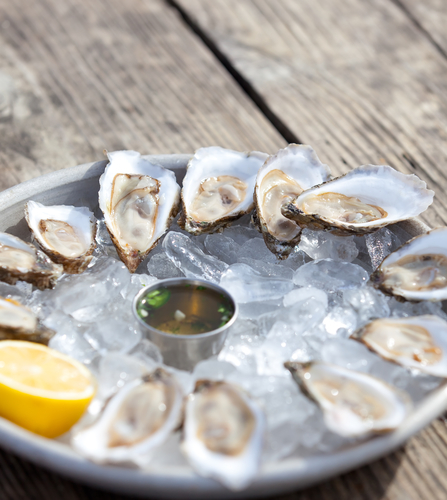 And the best source of zinc comes from oysters! 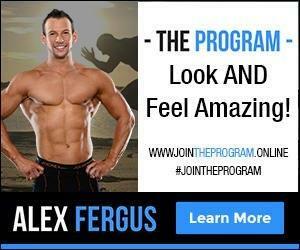 If you are looking for more diet and supplement tips to help you pack on some serious muscle, be sure to download my FREE 'Eating For Muscle Gain Guide'. These 5 foods are packed full of everything the body needs to optimize anabolic hormones and facilitate muscle growth. 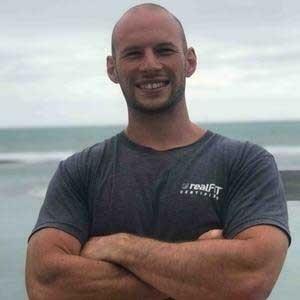 Not only is there plenty of scientific evidence supporting the benefit of these foods to pack on muscle, but also the anecdotal proof is solid. In a time before steroids and advanced supplement stacks, many of the world’s top bodybuilders swore by consuming these foods. The photos sure prove that it worked well for them! I’d love to hear your thoughts to this article, how does the list line up with what you were expecting? And how many of the 5 foods are you eating on a regular basis? And remember to to download my FREE 'Eating For Muscle Gain Guide'. 2. Katorski, B. et al., “Growth hormone effect on the role of fat in nitrogen metabolism,” American Journal of Physiology 209, no. 5 (November 1965): 910–12, http://pmid.us/5849491. 3. Smith, R. G., “From GH to Billy Ghrelin,” Cell Metabolism 10, no. 2 (August 2009): 82–83, http://pmid.us/19656485. 7. Tsai L. et al. Basal concentrations of anabolic and catabolic hormones in relation to endurance exercise after short-term changes in diet; Eur J Appl Physiol Occup Physiol. 1993;66(4):304-8. 8. Netter A. et al. Effect of zinc administration on plasma testosterone, dihydrotestosterone, and sperm count; Arch Androl. 1981 Aug; 7(1):69-73.